In the past few weeks, I have been lucky enough to be introduced to a new (to me anyways) cat blogger named Lola. Today, I present to you my exclusive interview with Lola the Rescued Cat as Pawsome Pet of the Week. 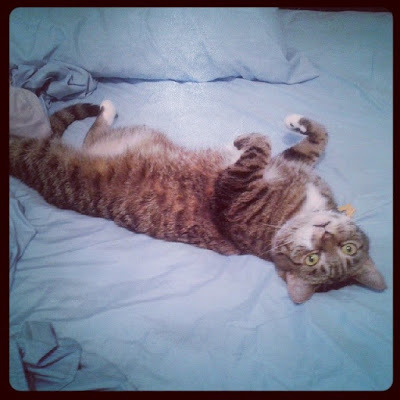 Lola is an approximately 5 year old ladycat who lives in the "outer borough" of Queens with her Mommy and big sister, Lexy, who is also a rescue. Since Lola is a rescued cat, she's not sure exactly how old she is but her family celebrates on June 27th. Lola used to live in Spanish Harlem in New York City. "I’m a brown/grey Tabby and I have white paws, and sometimes if I sit a certain way it looks like I have a heart on my chest. Oh, and I have a very long, elegant tail. (To this day I say that Mommy fell in love with my tail before the rest of me! MOL)"
Lola certainly is a very lovely ladycat, don't you think? During our interview, I asked Miss Lola what made her so pawsome. It seems as though she makes a wonderful bodyguard for her Mommy! "I am the best purrsonal bodyguard ever. I’m Mommy’s shadow and I follow her everywhere around the house to make sure she’s safe. Whenever she sits on the couch I’m right there on her. If I’m not sitting on her lap, I’m sitting on the arm of the couch watching TV with her. (I’m a pawesome TV buddy!) And at night I keep her warm by sleeping on top of her. I’m also pawesome because I’m sweet as pie and I have a very calm disposition. I never get angry and I never bite, scratch or hiss. (OK, I admit I hiss at Lexy sometimes, but never at a human.)" Lola told me all about her most favorite activities. 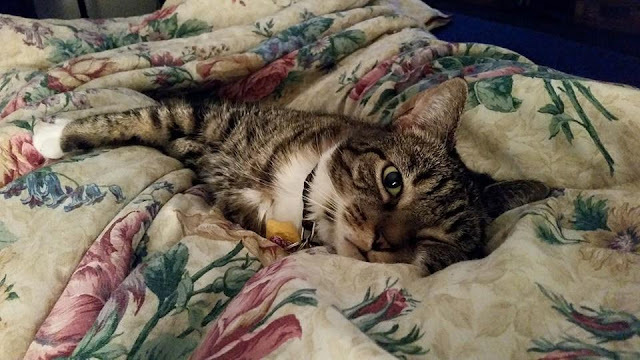 She has quite a few, but the ones she likes most include sleeping on her Mommy's pillow when she's not home, bird watching through the window, playing with cat toys, and playing with her string. She admits the string is really a shoelace, but close enough, right? "My favorite toys are the Cat’s Meow, Cat Dancer and Da Bird. They are so much fun! I also love my string (which is really a shoelace) and will carry it around in my mouth meowing so Mommy will play with me. But the thing I love the MOST is sitting on Mommy’s lap and licking her. I also do this with other humans. I’m a love bug, what can I say?" Lola also likes to eat food, and she is very particular about the kind of food she eats. She claims that she is a "picky" cat. "I’m a little picky with food and it drives Mommy nuts. I’ll eat just about any brand of crunchy food in any flavor, but canned food is another story. I’ll only eat Fancy Feast (Grilled variety only, please! ), and only about two teaspoons from the can. I do love treats, though! I love Temptations and Friskies’ Crispies. They’re delish!" Lola's special abilities include talking and turning frowns into smiles. Her Mommy's boyfriend says that she can "turn anyone's bad day into a good one" and that "as soon as he sees her, the bad thing that happened during the day just go away". Lola is also very "chatty" and enjoys talking ALL the time. Lola hopes to teach her humans to speak cat some day so that they can understand her. As a rescued cat, Lola has had a rough life in her past. You see, she was found in a dumpster when she was a youngster. Even though Lola used to be skittish of humans after her rescue, she is now proud of herself for overcoming her past. "I’m proud that I was able to overcome my past. Even though I had a rough time when I was only six months old and I was very scared for a while, I am a brave girl now. I used to run when Mommy came home, and when strangers came to the door, oh boy, did I hide! Now I greet everyone when they come to visit and welcome them to our home. I was also scared of every little noise and would run and hide in the tub or under the bed. Now I don’t even pay attention to them and just keep on doing whatever I’m doing. I think I could be a role model for humans who have gone through a rough time and help them learn that letting things go from your past can help you live a happy life in the present." I think Lola is a wonderful example of just how loving many cats can be if you just give them a chance. In fact, Lola has taken her story and turned it into a book. Yep - she's a published author that is bringing attention to animal cruelty all for a good cause. "I’m an author! I wrote a book about my life story to bring awareness to animal cruelty and to what happens to some animals when they end up in a shelter. I was thrown away in a dumpster and ended up in the city shelter system where I got very sick and I want to save other animals from that experience. 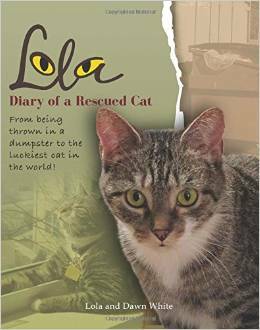 My book is called Lola: Diary Of A Rescued Cat and we donate ten percent of our proceeds to animal charities. 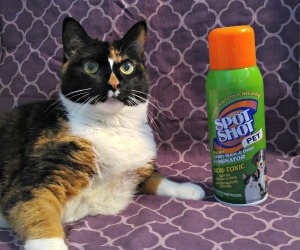 I’m proud to be a spokescat for animal rescue. I’m saving the world one rescued kitty at a time!" Lola's book is available for purchase on Amazon here. 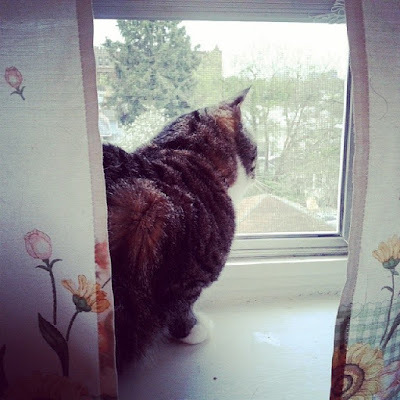 You can find Lola over at her blog - Lola the Rescued Cat. She's also on Twitter, Facebook, and Instagram. Special thanks to Lola for taking the time to chat with me for this interview. I hope that all of you are enjoying reading and "meeting" all of these Pawsome Pets just as much as I am! Stop by next Friday for a new Pawsome Pet of the Week! Great interview. I need to get that book. I love Lola's blog too. We love you guys, too. Lola sounds like an awesome cat! I've been wanting to read her book. I will definitely go check out her blog. Thank you for interviewing me, Miss Ann! I had so much fun answering the questions. 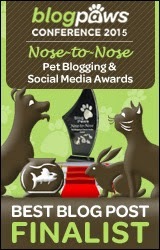 We love our blog and appreciate you supporting ours.And thank you for thinking I'm pawesome. Smooches! Oops. I meant to say we love YOUR blog. Lola the Rescued Cat with Lola, Lexi and Dawn are one of my favorite blogs, thanks for the interview. That was a great interview and Lola is indeed a very special girl! It's so nice to meet Lola - she seems like an adorable kitty. I love reading cat books, so I must check our her book. thanks for sharing this great interview with us! It does look like a good book! Love the interview! She's beautiful! A cat from my old neck of the woods - yep, I'm a Queens NY girl. Great interview. I love these series. What a beauty Lola is! She sounds like a fun girl, and I love her story of overcoming her fears. I'll have to add her book to my reading list. I do too... it reminds me of Honey Delight after I helped my father adopt her. We hope you like our book! Thanks, Tabbies! We're so glad we're friends now. Pawsome interview! A love bug bodyguard? Lola is just about the best interviewee ever! Lola sweetie, you have quite a rescue story. I enjoyed reading all about you and getting to know you better.you are areal sweetheart for sure. Lola, I'm so glad you're getting your story out there! Maybe it will help other kitties who had a rough start in life. Thank you, Summer. I hope it does. We love Lola! Thanks for featuring her today. I love you guys, too! What a great interview! The lady and I love Lola and Lexy and their blog! Awww, Annie, you're so sweet. I love you guys, too. Our mom got to meet Lola's human last week!!!!! 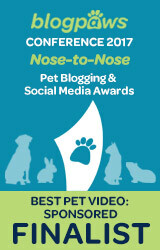 I heard that she was at BlogPaws! Lola appears to have made herself right at home in her home. Good for you kitty!